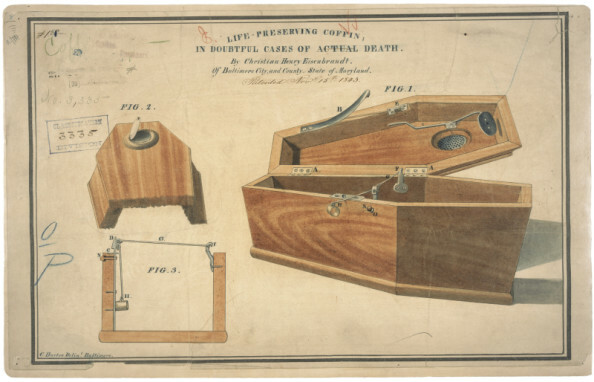 This is the printed patent drawing for a life – preserving coffin invented by Christian H. Eisenbrandt. The fear of being buried alive led Christian Henry Eisenbrandt to patent a “life-preserving coffin in doubtful cases of actual death.” In his application, he claimed that through a series of springs and levers, even the slightest motion of the head or hand would instantaneously open the coffin lid. We have put her living in the tomb! The End is near–the end of the Things That Scare Us series. Today we lift the lid on stories of burial alive and find the subject seething with maggots of horror. “The Corpse Wanted Help,” a story from Strangest of All by Frank Edwards terrified me when young and still makes me shudder. In the story, an Italian woman who was buried alive tells in a séance of her horrifying death. When her coffin was dug up, her knees were found flexed against the coffin lid, her clothes were torn to shreds, and, most chilling of all, her finger tips were bitten off in her agony. The subject has fascinated and frightened me ever since. Strong words, yet even allowing for exaggeration, the thousands of lurid newspaper articles about the prematurely buried and the nearly-buried, bear testimony to the extent of the fear. I have just heard of one of the most horrible, heart-rending, and yet, perhaps, unavoidable affairs which it has ever been my lot, as a newspaper correspondent, to record. It is nothing more nor less than the frightful reality of being buried alive. A most estimable lady, named Mrs. Crane, whose husband is a book-keeper in Flemming & Co.’s drug store, on Magazine Street, in this city [New Orleans, LA], died very suddenly last July, of what was pronounced sun-stroke. She was a school teacher in one of our most popular public schools, and resided, if I am not mistaken, on Dryades Street. It was in the afternoon, after school was out, that she went to visit a neighbor on Felicity Street and just as she entered her friend’s house, she fell insensible to the floor and expired, to all appearance, in about two minutes, a doctor pronouncing it sun-stroke. Her body was interred the next day, at ten o’clock, and her mother, an old lady about fifty years of age, and her husband and one little son, went home almost broken-hearted and have since been nearly distracted, being at times unable to sleep, and, in fact, leading a most miserable and disconsolate life; and well they might, as the sequel will show, had they known what they had done. Well, one night last week the mother, after passing a most distressing day, fell asleep late at night and dreamed that her daughter had been buried alive. She jumped up in a frantic state and rushed to her son-in-law’s chamber crying, “My daughter is buried alive! Oh, my daughter is buried alive! What shall I do!” To sleep any more that night was out of the question; she still crying that her daughter was buried alive, whenever her son-in-law would try to quiet her. At length the proposition was made to have the body disinterred just to satisfy her. So, early the next morning the grave was opened and the coffin raised. Oh, what a horrible sight met their view. Pen is powerless to portray the scene which followed. The body, which had been placed in a metallic coffin, was turned over, the glass covering the face was broken to atoms, the ends of her fingers being beaten and battered all to pieces; her hair torn out in handfuls and her shroud torn in many places—all presenting the appearance of one of the most desperate struggles to free herself from her terrible misfortune. If any of your readers could have seen the relatives of this unfortunate lady, when the condition of what they supposed was the perpetually silent tomb had been brought to light, it would have forced a tear from the most stolid and adamantine heart. It was one of the most distressing affairs ever recorded in this State and I sincerely hope it will be the last I am ever called upon to record. I have not seen this affair mentioned in any of our city papers, but as far as the truth of the matter is concerned, I can vouch for it having occurred, as I have it from parties intimately connected with the unfortunate family and whose veracity I cannot doubt. The husband and mother, it is now said, are almost entirely bereft of their reason, and it is feared they will go permanently deranged; and, indeed, they have sufficient reason. This sound advice on decomposition is a common warning in the literature of premature burial. While today the boundaries of death are a shifting ethical minefield, without the benefit of modern medical technology, physicians of the past relied on the misted mirror and tell-tale heartbeat to confirm that life still lingered. In cases of coma, catalepsy, or cholera, more drastic measures had to be taken: electric shock, red-hot pokers on the soles of the feet, “irritating” powders, needles run beneath fingernails, whipping with wet towels, burning the skin to see if it blistered, and holding the hand up to the light to see if it was red with circulating blood. Cholera was a particularly devious dissembler of death, as those who were infected seemed to die very quickly, but might actually be in a coma. Attendants were disposed to bury first and ask questions later. Victims were often thrown into mass graves while still alive and more than one cholera cemetery is reputed to be haunted by those tortured ghosts. While the Germans built waiting mortuaries to hold the dead until decomposition was obvious, the French, apparently concerned about that “2 per thousand” statistic, were on the cutting edge of research and resurrection, with such instruments as the necrometer. Fortunately, few of us will have any field experience in premature burial. But you know you’re die-curious. Let us hear, first-hand, some voices from the grave. The Astonishing Experience of a Wealthy Indiana Farmer. A Trance Which the Doctors Pronounced to Be Death—How the Corpse Startled the Mourners on the Way to the Quiet Cemetery. On the evening of June 18, 1868, George Wellington, an Indiana farmer, had a gathering of friends at his house. He was a man of forty-two years of age and of robust health, and on this evening it was noticed that he was in particularly good spirits. After the guests had departed he remarked to his wife that he felt more like singing and dancing than going to bed. They retired about half-past eleven o’clock, and she was asleep before midnight. The farmer was always out of bed at five o’clock, but on the morning following the party the wife awoke at six o’clock and found him still sleeping. When she attempted to arouse him she discovered that he was dead. A doctor was sent for, and he arrived in the course of an hour to pronounce it a case of heart-disease. He said the man had been dead three hours when the wife awoke. The undertaker came and prepared the body for burial. It was remarked that the corpse retained a life-like appearance, and that none of the limbs grew rigid, but the two other physicians called in vigorously combated the idea that he was in a trance and might be restored to life. Nevertheless, the wife and sons had a secret hope that death had not really come to him and the funeral was put two days ahead. During the interval the corpse was constantly watched for signs of returning animation, but nothing occurred to delay the funeral arrangements. “I did not fall asleep until some time after midnight. When I awoke the clock was striking five. I made a move to get out of bed, but, to my great amazement, I could stir neither hand nor foot. I had the full use of my ears, but I could not open my eyes. I argued at first that I was not yet wide awake, but when my wife shook me and called me by name, and I could not respond by even moving an eyelid, I became satisfied that I was in a trance. My mind was never clearer, and my hearing was painfully acute. I made effort after effort to throw off the great weight which seemed to be holding me down, but I could not bend a toe or crook a finger. However, it was only after the doctor had pronounced me dead that I felt any alarm. Up to that time it had seemed as if I could soon manage to get rid of the weight. Had a pistol been fired in the room I am sure the spell would have been broken. After the doctor’s ultimatum I felt that I should be buried alive. But was I alive? All of a sudden this query flashed across my brain, and I was troubled more than I can tell you. As I had never died before, how was I to know the sensations? Could the dead hear and think! Was the mind of a corpse in active operation? It was a problem I could not solve. “Not a word was spoken near me which I did not catch and fully understand. There was a great deal of weeping, and I failed to satisfy myself as to the cause. I had died, but it did not seem as if this was a sufficient excuse. When my wife bent over the coffin, and sobbed, and grieved, and refused to be comforted, I did not feel bad with her. On the contrary, her action surprised me. When the two other doctors pronounced me dead I made up my mind that I was dead and that the end had come. “As an instance of the acuteness of my hearing, let me explain that after I was placed in the coffin the receptacle was moved over to an open window in the parlor, where it was supported on saw-horses. Two of my neighbors took seats on a wagon box in the barn-yard, fully two hundred feet away, and for an hour conversed of my death in ordinary tones of voice. I did not miss one single word of the conversation as both afterward admitted. I could hear every tick of the kitchen clock, and much of the conversation of the women in the up-stairs rooms. On the night previous to the funeral, about half-past ten o’clock, and while the two men sitting up with the corpse were reading, I heard two men climb the fence into the barn-yard, cross the yard and enter the barn. After a few minutes they came out, and I heard the jingle of something carried by one of the pair. I could not make out what was going on, but learned afterward. The two men stole a horse from a field opposite my barn, and they entered my premises in search of a bridle. THE WONDERFUL RESUSCITATION OF CLARA MUNCE. PLACED IN THE COFFIN AND PRONOUNCED DEAD BY THE ATTENDING PHYSICIAN SAVED BY AN OLD LADY. “Why, to whom does this refer?” asked the reporter. “It refers to me,” replied Miss Munce quietly. “It was on my coffin—-at least I suppose I may call it my coffin, though I was not buried in it. I occupied it, however, for several hours, and had it not been for the intelligence of a lady who came to attend my funeral, I should have been in it now. My uncle took it to his home in Chicago, where he is fond of showing it to his friends and telling my story. I kept the plate, which I seldom allow any one to see, for the recollections it awakens are not pleasant. “When I was a young girl I was in very delicate health. I used to fall into trances, in which I knew all that was going on around me, and I heard every word said in the room where I lay, but I could not speak or make the slightest sign of life. My body grew gradually colder, but ordinarily I aroused myself with a start within ten or fifteen minutes. The doctor said it was a form of epilepsy, and warned me that some day or another an attack might be prolonged and mistaken for death. It always affected me under the same conditions.After sleeping, as consciousness slowly returned, I found myself wide awake, but unable to speak or move. For more than two days she lay motionless on the bed. Tuberoses were strewn over her. Friends came to see her, and reminded each other of good qualities in her that neither by herself or others had ever before been suspected. She heard it all. Nobody spoke of her except as a corpse; none noticed, what she is sure must have been apparent, that her face had not lost the color of life, and on the night of June 4th she lay beside her open coffin! On the morning of the 5th she was put into it, for she was to be buried that day. She had heard the inscription on the plate read aloud, over and over again: “Clara Munce. Aged 16 years. Poor girl! So young to be called away. But she was always delicate!” She could not even try to speak or move. All volition seemed to have died in her, and she could only pray silently that she might die, too, before the last rites were performed; but she felt that there was little chance of that, because she was full of life. It was perfectly true, though up to that time nobody had noticed it. The mental agony of the sufferer had made her nose bleed. These preceding cases illustrate two common methods for the rescue of the undead: an alert relative and the jarring of the casket. Another method was to be dug up by resurrectionists and revived at the first stroke of the dissector’s scalpel. See here for a case of a child saved from a premature grave by body-snatchers. Two men, a US Army Surgeon, Colonel Edward P. Vollum and Sir Benjamin Ward Richardson, eminent sanitary reformer and anaesthetic researcher, founded The Association for the Prevention of Premature Interment in 1895. When Dr. Richardson died in 1896, he was cremated, something advocated by the Association to prevent burial alive. Here is what Col. Vollum had to say about the Association. Note the suggestion about chloroform in the coffin. ASSOCIATIONS FOR THE PREVENTION OF THE BURIAL OF PERSONS ALIVE. Owing to the absence of proper laws relative to the disposal of the dead in most places; to hastiness of burials during epidemics; to the uncertainty in the signs of death; as well as to the existence of certain states that counterfeit the appearances of death very closely, we, the undersigned, believe that there is more danger of the appearances being taken for real death, and of persons being buried alive, than is usually supposed. This, our belief, is based upon scientific demonstrations which show that even the stoppage of the beating of the heart and breathing, for a considerable time with all the other appearances of death, excepting putrefaction, do not make it certain, that a person is dead, and that the suspended activity of life may not return after his body has been interred. Therefore, we have associated ourselves together for mutual protection against such a horrible possibility. With this object in view, we earnestly advise our associates to exercise the closest vigilance (particularly with women and children) with regard to the result of the following diseases and conditions, since it is known that they are frequently the cause of a state of seeming death, that may deceive the most experienced; and we hereby mutually agree to discourage embalming, autopsy, burial or cremation in these cases, until every possible source of doubt is removed, namely, trance; catalepsy; syncope; hysteria; stroke by lightning; sunstroke; anesthesia from chloroform, etc. ; coma in pregnancy; cold; asphyxia from various gases, vapors and smoke; narcotism from opium and other agents; convulsive maladies; drowning; nervous shock from gunshot; electricity and other injuries; smothering under snow, earth, grain, or in bed; strangulation; epilepsy; hemorrhages; suspended animation from excessive emotion, as horror, intense excitement, etc. ; apoplectic seizures; so-called heart failures; and all other cases of apparent death that do not show ample evidence of having passed through disease of sufficient duration and severity to cause actual death. We hold ourselves ready to question cases of alleged sudden death, unless the body has been greatly mutilated, or where some vital organ has been injured; and in the uncertainty that exists in the signs of completed death, we will refuse to accept as infallible any evidence except decomposition itself. Furthermore, though death may be admitted by all concerned and interment seriously decided upon, yet, if decomposition has not become unmistakably manifest, we request as a final favor if autopsy or embalming has not been performed, that there shall be placed in the coffin a bottle of chloroform with a leaky stopple, in order to fill it with the vapors sufficient to last a long time; and this, as well as all other provisions in this agreement, we will to be done for each of us. We would also recommend this practice to others, as a concession to a natural and prevalent dread of premature interments. Associations for the prevention of premature burials are easily formed privately among relatives and friends, or can be engrafted upon any club or other organization. Public opinion will grow from these, and reforms in burials will follow. Med. Dept. U. S. Army. Before we look upon this scary subject for the last time, let us note that burial alive, if properly executed, could be the perfect murder method. A young nobleman, who had squandered away his fortune, found his sister, to whom he applied for assistance, not the least inclined to sacrifice her patrimony to his taste for dissipation. You’ll find more 19th- and early 20th-century stories of ghosts, entities, and apparitions in The Ghost Wore Black: Ghastly Tales from the Past. Available as an e-book for Kindle and in paperback at Amazon and other online retailers. Ask your local library or bookstore to order copies from hauntedohiobooks.com. You’ll also find more stories of burial alive in my book, The Victorian Book of the Dead.